It’s a familiar scenario for all travel anxiety sufferers. You book a trip, and the very thought of it sustains you for months. You look forward to it, and count the weeks down until you go. Shopping trips are taken, and you return with sunscreen, dresses, and a hat which you know is going to get squashed in your suitcase. Your Facebook posts tag your fellow travellers, with a squeal of “three weeks to goooo!”. And then anxiety knocks on the door, barges in without wiping its feet, and whispers “three weeks until you DIE!” in your ear. It might sound ridiculous to anyone who doesn’t suffer from travel anxiety, but your mind really does start to think that way, and the perfect pink cocktail that was your trip abroad becomes a poisoned chalice. You suddenly go very quiet when people talk about your trip, because the doubts are starting to set in. What if you get attacked, mugged, killed? If you have all your money stolen, what will you do? Have you done your research correctly, or are you walking into a death-trap? It can be hard for an anxiety sufferer to control – and for non-sufferers, it can be hard to watch a loved one go through it. You’ll both be wondering what you can do to help it, or alleviate the fears. And it can cause anxiety even in a non-anxiety sufferer, because you’ll be wondering if your travel companion is going to quit halfway through your trip, or even cancel before you even make it to the airport. So, what can you do to help with pre-travel anxiety? There’s a simple answer: hit the internet. There’s now a wealth of products and resources available to anxious travellers which can really make a difference – I’m living proof, as I’ve used them myself. From physical items to internet downloads: this is the ultimate guide to the things which can really make a difference, whether it’s before you leave, or whilst you’re on the road. Gathering your travel anxiety kit together before you leave is vital. Trust me, you are not going to beat your pre-travel anxiety by waiting for your departure date, and hoping that it magically goes away. Even if it does dissipate the moment you touch down on foreign soil, you are going to be so wrecked by the effects that the anxiety has had on your body. It’s well-known that stress and anxiety compromise your body’s immune system, leaving you susceptible to colds, flu, and viruses. Certainly in my experience, pre-travel anxiety has led to me not eating or drinking enough, making me sick for the first few days. You don’t want that ruining your trip! So have a look at the items I’ve listed below, and use them to create your own anti-anxiety travel kit. Every time you look at them, or use them, you’ll be reassured that you’re as prepared and as safe as you can be. If you’re getting them for a loved one or travel companion, you can be happy in the knowledge that you’ll be really helping, and potentially making your own trip much easier! By the way, if you’re planning traveling for many months, you should definitely check out this guide to long-term travel – the more info you have in advance, the easier preparations will be! You can go to all of these places! But get insurance first. Don’t leave home without it, folks. Having travel insurance is an absolute must for your pre-travel anxiety kit – no other item is going to reassure you as much as this one. With this in your pocket (and I highly recommend printing off a copy of your policy, and taking it in your bags), you’re covered against any emergency you can visualize. If worst really does come to worst, your travel insurance will repay medical treatment, and get you home. Something as simple as an insect bite can end up in a hospital trip, costing you hundreds of dollars, and a lot of stress – and yet I know so many people who travel without it! Get a travel insurance policy, and feel some of those health anxieties slip away. I really recommend World Nomads – it’s been created by travellers, for travellers, and it accordingly has options which fit any trip perfectly. 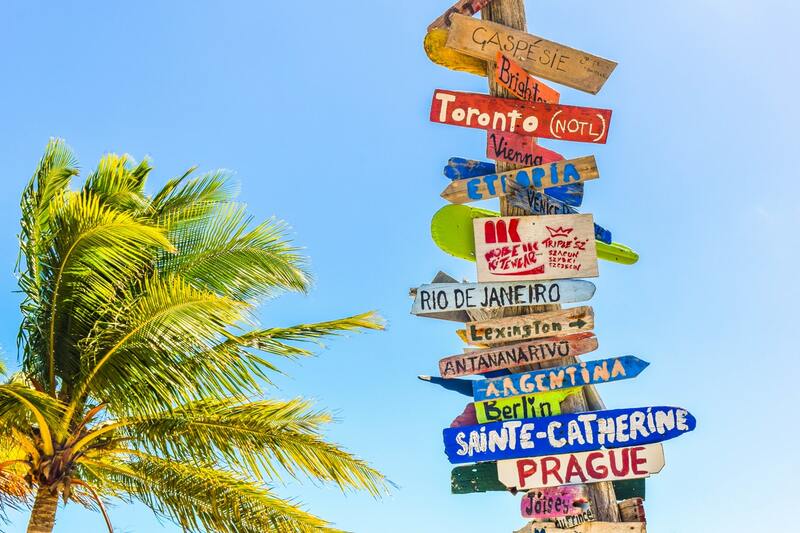 It’s especially great for backpackers: for example, you can set the region you’ll be travelling to as Southeast Asia instead of specifying countries, if you’re planning on having a more flexible plan. There’s also specialist plans for scuba or snow trips, so you really do feel like you’re being looked after someone who knows what they’re doing! This little gizmo has saved my bacon (mmm, bacon!) so many times, and it’s so inexpensive and simple. We’re pretty reliant on our mobile phones these days, and it’s no different when you’re travelling. Although being able to turn off the phone for a few days is fantastic, having a constant smartphone presence is really helpful for travellers, whether you have anxiety or not! There’s a whole raft of apps which can make your travel life considerably easier (and I’ll be telling you about them further down this list! ), but there’s one drawback – they tend to absolutely gobble up your phone’s battery. This leads to you being stranded without your apps, with no way to call for help or reassurance, or fretting about your family panicking when they can’t reach you. Don’t do it to yourself! Get an inexpensive portable battery charger, and you can use a USB cable to connect your phone to it anytime. I keep a RAVPower charger and a USB in the inside pocket of my bag, and I’ve used it so many times with no issue. It can completely recharge my phone about four or five times before the charger needs recharging – plenty of time to get you back to your hotel – and it does it really fast! Here’s the exact model I use on Amazon UK and Amazon US – this comes highly recommended for your pre-travel anxiety kit. Lonely Planet: consistently the best in their field. Although the world is moving towards getting more and more of its information from the internet, there’s still something really reassuring about having a physical copy of a book. Perhaps you’re off the beaten path, and there’s no wifi or 4G – how do you look up how to get to that temple? Or you need to make a phone call, and you can’t for the life of you remember what the country code is. Or you just want to read up on a country before you visit, learn the sidebar tips, or brush up on the history or culture. As you can see, there’s still a lot of value in having a physical copy of a book to hand. My personal favourite range, as anyone who’s ever seen my bookshelves will confirm, is Lonely Planet. There’s a reason why they’re the market leader; on the whole, their books are the highest quality and practical travel guides you can get your hands on. Do they have loads of pretty photos? No, but they have a heck of a lot of helpful text packed in instead, from hotels and recommended places to eat (very useful for anxious travellers, when you like to know what to expect), to language basics and cultural notes. If I’m going anywhere, I like to get a Lonely Planet guide, and read it cover to cover. I really do feel that I’m prepared afterwards: I know the country, I know the regional differences, I know where yo go and where to avoid. I know how to not put my foot in my mouth! Plus, wherever you’re going, Lonely Planet will almost certainly have a book devoted to it. Find your destination at Amazon UK and Amazon US. Moovit: simple to use, but a powerful navigation tool. Seriously though, this free public transport app has rocked my world since I discovered it. You can use it on a desktop to check out a route before you leave, or even better, use the app when you’re on the go. One of my biggest anxiety moments when I visited Munich was arriving at the airport – it was a public holiday, so there weren’t many staff around, it was late at night, and I had no idea how to navigate the train system and get to the city center. It really wasn’t fun. Unless you consider flailing around various train platforms as fun. I wish I’d discovered Moovit at that point. The app tells you exactly how to get somewhere, by a variety of transport options. Buses, trains, and various other modes of transport are covered, and it’ll even monitor your progress and send you a notification that your stop is coming up – really useful when you’re somewhere unfamiliar! Public transport, and your unfamiliarity with it, can be one of the biggest sources of worry for the anxious and non-anxious alike. Putting Moovit in your pre-travel anxiety kit will assure you before you even leave, as you can change your region and scout out the route ahead. It’s definitely a stress-saver! Keep your passport protected with a RFID wallet. Another really inexpensive option that will save you so much pre-travel anxiety, as well as saving you stress at the airport! I admit that I’m quite late to the travel wallet game. As late as a couple of months ago, I wasn’t using one – instead, I was relying on the front pocket of my trusty Osprey backpack to hold all my documents. Everything fitted in there just fine – but that was the problem! The pocket was so big, and my passport was so small, that I was constantly losing it. I was in a queue for security at Amsterdam airport desperately scuffling my bag across the floor as the queue moved, pulling bits and pieces out in a desperate attempt to find where my passport had slid off to. Amsterdam airport really did not need to see my souvenirs and underwear. So my boyfriend bought me a travel wallet, and my travel life changed! Suddenly, I was organised! I floated through security lines with the greatest of ease! Having a travel wallet (especially one with a looped holder on the side, allowing me to sling it around my wrist) kept my passport, tickets, insurance and money in one place, whilst I carried my backpack. It honestly made everything so much easier. For extra peace of mind, buy a wallet which blocks RFID readers. All passports these days have an electronic chip in them (that’s what allows you to use those fancy electronic readers at the airport) – although it’s unlikely that someone is going to be walking around with a hidden reader, scanning your information, why take the risk? Have a look at some great wallets at Amazon UK and Amazon US – they’re so worth the tiny cost! Anything is possible: sometimes, you just need a little help. Regular readers of this blog (hello! I love you!) will know my story quite well. Basically, I suffered from severe anxiety and travel anxiety for years, rendering me almost unable to step outside the door, let alone travel. The single factor which turned things around for me, and gave me the physical tools I needed to be able to make the journey back into travelling, was an online travel anxiety course. You’ll find a few of these if you do a Google search, often run by airports or airlines – and often not cheap! – but I thoroughly recommend the one I took: Lauren Juliff’s How To Overcome Travel Anxiety course. Lauren is not some business exec or corporate company; she’s a fellow travel blogger (and a friend!) who has been in exactly the same position I was, and exactly the same position that you might be in. Everything in the course has been learnt through personal experience, and the techniques she shares for coping with travel anxiety have worked for her, and definitely worked for me and the others in the private group you’ll be added to. It absolutely worked wonders for me! I have zero doubts that without her course, I never would’ve got on the plane to Italy, which was a catalyst for me getting back into being a traveller. Plus, the private group that I mentioned is worth the entry alone. You’ll have access to people who are in exactly the same boat as you (as well as Lauren herself), and we all support each other brilliantly – we can post when we feel the fears, and have the experience of others to reassure us. Plus if you download the Gumroad app, you can read the course while you’re travelling! It’s yours for life, whenever you need it, and it’ll truly make pre-travel anxiety a thing of the past. SkyGuru: a revolution in flight anxiety. If the name of this app rings a bell, it may be because I wrote a review of it – I wasn’t sponsored to do so in any way, nor was I approached by the company; it was purely something which made such an enormous difference to my pre-travel anxiety that I just had to write about it! If you suffer from flight anxiety, then it’s a MUST. SkyGuru (free to download, small fee to buy ‘trips’) is a simple idea, but brilliantly executed; it takes the role of an off-duty pilot, who sits next to you on your flight and explains to you exactly what’s going on. Speaking personally, I know that engine noises and sudden drops in altitude used to really freak me out – I once poked a nail through the fabric of an armrest because I was gripping it to hard; sorry, IcelandAir – but no more. SkyGuru listens to the noises around you via your phone’s microphone, and gently explains to you what they are. On my flight to Amsterdam, there were some men behind me who were nervous because of a weird, scraping noise before the plane took off. Not me: SkyGuru had already explained that it was the plane’s hydraulic system, and that it was perfectly normal. Even better than that, SkyGuru takes advantage of wifi before you depart to analyse the weather, and predict where and when you’ll hit turbulence. Then it’ll calmly talk you through it, until you’re not nervous anymore. This is utter genius. I also really recommend SkyGuru to anyone who is travelling with nervous kids; by having it on an app on their phone, almost like a game, it’s a fantastic way to soothe their fears. The app also shows you a representation of your plane, and tells you plenty of facts about aviation in general, so you may find that your children garner an interest in flying as well as losing their fear of it! See the world, and tune out the annoying bits. Whilst we’re on the subject of flights, get yourself some good headphones! Noises are often a trigger for anxiety – certain noises send my anxiety shooting up, and this can be even worse if you’re on a plane. Before I discovered the SkyGuru app above, I used to obsessively listen out for engine noises. Any slight difference in the whir of the engines was met with an instant spike of panic and an increase in heart rate. Headphones do away with all that! For the best results, you’ll want to get some noise-cancelling headphones – and the good news is that they’re really not expensive anymore! Gone are the days when you had to sell your belongings / grandmother / soul; have a look at your choices on Amazon UK and Amazon US. Noise-cancelling headphones also serve a double-purpose: a lot of people worry about not being able to sleep due to noise at night (especially if you’re staying in a hostel), but these are your perfect solution. If you want something a bit more distracting than the sound of silence, then headphones are your friend too. If you have your music on your phone, or downloaded to an offline version of Spotify, you can actually use it to your advantage. Everyone has tracks which they associate with good times, holidays abroad, or just feeling awesome. I can remember the exact track I was listening to as I landed at Cincinnati Airport with a huge grin on my face at having survived the flight (Single Gun Theory’s “From A Million Miles”), and every time I hear that song, it makes me pumped to go and travel somewhere. Use that! Compile a playlist of travel songs, and that pre-travel anxiety will turn into excitement. It’s easier than you think to convince your heart that it’s not beating fast from fear, but from anticipation of a new adventure! Okay, we can’t pretend that a lot of pre-travel anxiety doesn’t come about because we’re worried about the people we might meet. Not the majority of people – 99.9% of locals are going to be wonderfully friendly and welcoming, and they won’t bear you any ill thoughts in the slightest. But there’s always that fear that we might be followed, targeted, attacked. That fear, because it can be so unlikely, can be strong because we know that it does happen, and for the most part we don’t have much prior experience of what is a devastatingly traumatic event. That’s where a personal alarm comes in. The chances are that you’re not going to need it, but it gives us that reassurance of safety, of help. Add to that, they’re exceptionally well-priced for such secure peace of mind. I like Vigilant’s alarms; they’re a quality make, unobtrusive, and as they’re activated by pulling a ripcord, they’re easy to set off in a struggle. Plus they’re quite loud enough to make plenty of people to the scene! Check the reviews at Amazon UK and Amazon US, and see if they’re a good fit for your needs. The most important aspect to getting a personal alarm is that it perfectly suits your requirements and gives you that sense of security; Vigilant’s alarms are definitely great place to start your search! Good luck finding a bad pizza in Naples! Another free app, and it’s brilliant for soothing your pre-travel anxiety. A lot of pre-travel anxiety comes down to a fear of the unknown. Is your hotel going to be a rat-infested fleapit? Is it in a really shady area? Will that restaurant around the corner serve you food that’ll make you sick, forcing you to spend the rest of your trip in your fleapit room? Are you going to get mobbed by tour touts when you visit that historic site? Well, take away the fear of the unknown by making it known. And TripAdvisor is absolutely the best way to do that. You can look up your hotel and make sure that it’s clean, quiet, and has everything you need. You can check the rating of that restaurant around the corner. And you can learn that if you approach the historic site from the other direction, it’s a lot quieter with way less touts. It’s written by travellers, people who have visited the place you’re going to, and it’s an invaluable resource in combating your nerves! I don’t know about you, but one thing that really sets off my pre-travel anxiety is the thought of having lost luggage. Is it going to fly off to Borneo without me? What will I do during my trip without it? Will I ever get it back? Well, alongside your smartphone, and smart water, and smart…things, we now have smart luggage tags to take away those lost bag worries. My favourites are made by Dynotag – they’re very well-made considering they don’t cost much at all, and they feature a QR code on one side, and your details on the other. You can electronically register your details via Dynotag’s site (and you can even update it after you’ve left, so don’t worry if you have more than one hotel stay during your trip), and if your bag goes awry during the flight, your details can be easily viewed. Even better, as soon as the QR code is scanned, it’ll automatically send you an email to tell you that it’s been located and viewed, and give you the location. I think this is a brilliant idea – it certainly beats being completely in the dark as to where your bags are, and it makes your bag more visible on the airport carousel too! Check them out at Amazon UK or Amazon US. Yes, ladies, we’re going there. Anyone who has ever travelled anywhere ever will tell you that sometimes the ladies facilities are not what they could be. Sometimes you don’t even make it into the cubicle before being beaten back by the stench, or you’re confronted with a squat toilet when you really weren’t expecting one. This really does cause a lot of stress: I have a friend who detests going out to restaurants because she can’t stand the thought of using a communal toilet seat. Fortunately, we have the power to get rid of this anxiety too, thanks to female urination devices. Yes, they might look a bit weird. Yes, they’ll probably make your friends and family giggle and smirk when you buy one. But think of it this way – is it worse to have a few chuckles directed your way, or to dehydrate and make yourself ill because you’re too scared to drink water, due to not wanting to use the toilets? Yup, female urination devices don’t seem so bad now. Capri on Maps.me – more scenic viewpoints than you can shake some Capri pants at. Maps.me is a hero of a free app – there isn’t a traveller out there who doesn’t get a bit anxious about getting lost. Sure, sometimes getting lost can bring you some wonderful discoveries, but at others times it can be inconvenient, time-consuming, or just plain dangerous. Maps.me stands out from the crowd because all of its maps can be viewed offline – this is vital in places which are off the beaten path (which is generally where you really don’t want to get lost), because you might not have that instant 4G access. So if you’ve got pre-travel anxiety about the area you’re travelling to, you can do a very quick download before you leave, simply by zooming into the relevant location. Then you can skip away, safe in the knowledge that you have the region in your pocket. Maps.me is also a favourite of mine because it shows viewpoints which may be of particular interest to photographers – this is fantastic for finding the shots which may be less well-known! When I visited Capri, there were a whole heap of people at a viewpoint overlooking the Faraglioni rocks. I checked Maps.me, and saw that there was another viewpoint just down a marked track – it directed me there, and I had the whole place to myself! We all know that drinking water abroad can be a bit of a risk – it’s not that the water is dangerous as such, but that your gut really isn’t used to changes in the composition of the water. You can even notice this when you travel in your home country: I regularly go and stay in a place which is 80 miles away from home, and it takes my stomach a day or two to adjust! When you’re travelling, you can generally get around this by drinking bottled water – but what if there’s none available? Or in real worst-case scenarios, what happens if natural disasters affect the water supply? Water purifiers are your solution, and they’re a real balm to pre-travel anxiety, especially if you’re going out hiking or staying in non-urban areas. A great brand is LifeStraw – aside from having a brilliantly-designed bottle which will do exactly what you need it to, without the use of any chemicals, they do a hell of a lot of good work in providing clean water to areas in Africa as a charitable venture. That’s worth the price alone! Have a look at the reviews on Amazon UK or Amazon US – you’ll see plenty of reviews from people who have backpacked in India or Southeast Asia, or drunk water from a stream whilst out hiking! However, if you want something a bit more advanced, and capable of anything that you might want to throw at it, check out this review of the Survivor Filter Pro system! It may be so obvious that you forget it, but put a first aid kit in your pre-travel anxiety kit! The advantages of keeping a first aid kid – preferably one as small as possible, so you can squeeze in that extra pair of shoes – are obvious. Just think for a moment on previous travels, or even journeys as small as going shopping, and think on how many times you’ve gained a blister, or a bite, or had something get stuck in your eye. Or even just needed a safety pin! I love this mini first aid kit, available on Amazon UK and Amazon US, because it’s So. Darn. Tiny. Look how much goes in that thing; it’s a TARDIS! Hopefully you won’t ever need it, but if you do, you’ll certainly be glad that you brought it along! My Italian copy of Game of Thrones, translated back into English. No worries, I don’t expect you to do that! I wouldn’t either! The genius of the Google Translate App is that you can download a small file before you leave, and then the app will be able to use the camera on your phone. Simply hold up the camera to the text which you need to be translated… and voila! The text will be superimposed with the translation in your own language. On the whole, it works pretty well – it does have an occasional tendency to change its mind on a few words, which can lead to some amusing translations – but it’s certainly good enough to get the gist of what you’re trying to translate. I used it multiple times in Germany and Austria, especially when I was trying to work out some of the finer details of buying a train ticket, and it definitely gave me an advantage. Short of learning a whole new language before you depart, Google Translate is definitely the next best option! This is another airport hack which will save you some stress, and fend off the pre-travel anxiety. Like the travel wallet above, this’ll have you breezing through airport security with barely a care in the world. Unless you’ve been living under a travel-rock for the past few years, you’ll be aware that when you pass through security, you can’t have any any bottles of liquid, pastes, or creams that are over 100ml in size. I have seen SO MANY people at airports frantically going through their stuff, and stuffing into the clear plastic baggies provided by the airport. I’ve seen even more people tearfully going through backpacks, and throwing out all of the massive product bottles that they thought would keep them going for the duration of their trip. Don’t do it to yourself!! Get some clear plastic travel bags from Amazon UK or Amazon US, and you can sort it all out before you even leave home. No need to scatter your belongings all over the airport floor, and see it get squashed by a baggage trolley: you can simply take this out of your bag, and drop it on to the x-ray conveyor belt. Life just got so much easier. Having all of these nifty anxiety-busting gadgets can be great, but what if that life-saving phone app is taken from your bag? What if your brand new battery charger and RFID passport wallet are pickpocketed away from you? Well, we can even bust that fear! Thanks to the wonders of modern technology (and just some excellent design), anti-theft backpacks are now a thing. What an anxiety-saver that can be – instead of feeling like you need to keep an eye on your bag at all times, you can pop your passport, phone, or camera in a backpack, and not give it a second thought until you need it. The benefits are immediately obvious – I’ve been guilty before of keeping my heavy camera in my shoulder bag, obsessively holding the zip because of a fear of having it stolen. Or even worse, putting the strap around my neck, and carrying it everywhere, which gives me a backache from the weight and marks me out as a tourist. Let’s not do this to ourselves. Check out an awesome guide to anti-theft backpacks here! Victory over pre-travel anxiety CAN be yours. If you want to get rid of those pre-travel nerves, then you need to do something about it pre-travel. There’s really no sense in just hoping you’ll be magically cured by the time you get to the airport: take the initiative, and assemble the items which can help you. Some of them may seem like “just in case” items – but those are the important ones! It’s the “just in case” scenarios which give you the most anxiety, because they’re not anticipated. You might not have experienced anything like them before, and by the time you find yourself needing them, you’re halfway to a messy anxiety attack. But most important of all, these are the things you can buy which will give you relief from the worries, the nerves, the anxieties. Some of your worst fears are covered, and you have the tools to deal with them, Equip yourself, travel, and enjoy the world! Got any travel items which might help with pre-travel anxiety? Let me know in the comments below! Or share the below image to Pinterest to help others out! Please be aware that this blog post contains affiliate links – these incur no extra cost to you, but give me a little towards the running of my blog, and keeps me stocked up on female urination devices! You are right, there are some great tips here, and definitely not just for the anxious traveller! Many of these simply make life easier while travelling for everyone! Wonderful ideas and suggestions. Thanks. Very important and useful post! Great job as always! Great read. Will be sharing with a few people as I know it will really help them! Great tips for those that suffer from anxiety and to be prepared. Lovely post. I didn’t even know that travel anxiety was a thing … but regardless, all this tips are very good for basically everyone who wants extra peace of mind ! Well done ! Thank you very much! 🙂 I tried to make it useful for everyone, whatever the level of worry, so I’m glad it worked! I LOOOVED this! I’m definitely gonna use these tips personally. Thank you for being thorough and transparent with your experience! This was such an interesting read! My grandpa is really struggling with anxiety right now, so it was informative to read this piece. Now I’m wondering if there are online courses for general anxiety. This is such a good idea – I suffer from travel anxiety too and there’s a few things I always carry with me by habit. But I’ll start thinking of it as a pre-Travel anxiety kit to make me feel more calm too. I’m definitely downloading SkyGuru! Thinking of it as a kit helps just by itself – instead of it being a few random items, the idea of a ‘kit’ feels researched, robust, and prepared. It sounds such a small difference, but it really does work! And the more items you have to cover your worst fears, the stronger the reassurance gets. 🙂 SkyGuru has helped me so much! I actually look forward to flights now, which I NEVER thought would happen! This is so helpful and I relate so much. I too start to freak out before I leave, espcially about getting to the hotel from the airport in a city I don’t know. Or my fave is turbulence and my first thought is, “ okay well i’m dead”. Lol. Will check some of these apps out. Ohh, we are just so alike – twinny! I hope the apps help; they’ve definitely worked wonders for me! What a great list of essentials of things to do/bring pre trip! I get really nervous before a trip too and I often write down a packing list even! Thank you! Yup, me too – I have to do one packing list for before I leave, and another for when I’m there! Saves that “have I got everything?” panic! I just want to start off by saying that you’re a breath of fresh air, when I read on Twitter that you were an “Anxious” Traveler, I actually thought…. “Did that say Anxious?” I actually have Panic Disorder. And even though It’s not as bad as it used to be, it’s so comforting to know that others can relate. This is an amazing list, I have to tell you though, not in one million years have I ever thought of buying a female urination device, nor have I ever seen anyone else put them on their travel list!!! I need one! I’m going to buy a couple of them, one for me and one for my daughter, you just never know when you will need one, I have been in some seriously skanky bathrooms and there’s me, trying to balance while I hang my behind over the toilet! — No fun!! Also– Thanks for the heads up about Maps.Me. I was using Citymapper, whichis great if you have wifi or near home and have cellphone service, but it’s absolutely useless!! I loved this post and look forward to many more from you! Hi Tammy! Thank you SO much for this comment – it really did make my day when I read it! My only aim is helping and inspiring others who might be in the same position, because the very nature of anxiety sometimes makes you feel like you’re the only one who feels that way, or gets those emotions. It’s so helpful and reassuring to find others! And I have done the ol’ toilet hover Too. Many. Times. And eventually your legs ache too much, and you have to sit, and that’s cleanliness freak-outs for the rest of the day. 😛 Who knew that female urination devices could be so useful! 😛 And yes! I love Citymapper too, but I have been caught out by poor signals – maps.me is an excellent ‘guaranteed’ service! Yeah i think travel insurance is very important when you are on vacation. Definitely! It really is amazing how many people travel without it – I believe only 40% of Americans take out insurance. This is one of the best travel posts I’ve ever read! Recently, I have been dreaming of all of the wonderful places I want to visit, but every time I imagine myself actually taking these trips, I get a feeling of dread, ESPECIALLY when it comes to flying. However, I refuse to let my anxiety keep me from experiencing the world, and this post helped so much. Thank you! This is some really good information about traveling when you have anxiety. It is good to know that it would be smart to plan some just in cames scenarios. That does seem like it would help you calm down a little. It might also be smart to read up on some anxiety control materials. Penelope Smith recently posted…Avoidance is the Best form of self-defense!